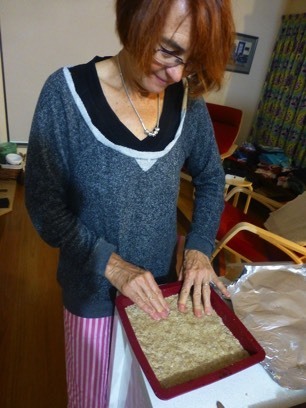 Blend rolled oats till finely chopped. Mix almond meal, oats, shredded coconut, protein powders and sea salt. Melt coconut oil over a low heat add rice malt syrup and flavouring. Mix coconut oil mixture into dry ingredients until well combined. 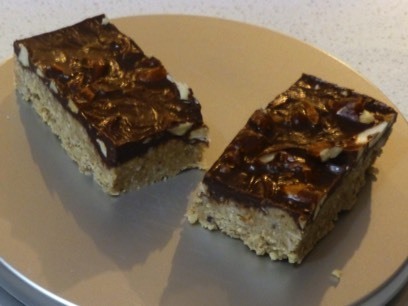 Press mixture into a silicone or paper lined baking tray and chill in fridge for 30 minutes. 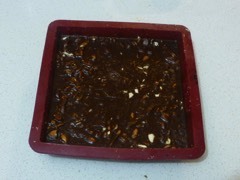 Whilst chilling make topping by combining cacao wafers, coconut oil, rice malt syrup and salt over a low heat till melted. 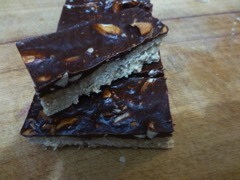 Spread cacao mix over chilled base and top with chopped almonds. Return to fridge till hardened. 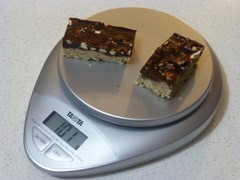 Cut into 16 pieces (for ~50 gram bars) or as desired.